Dean Terlinden (Quarry School student 1926-1934) sent me information about his Aunt Irene. He wrote that she is 96 [in 1999], still quite active, and is the last in his moth-er’s family of twelve. I mailed several Quarry School stories to Irene and waited for her response. On Decem­ber 20, 1999, I received her response. Her letter follows. You can keep the pictures with the names of the students on the back. [Irene sent two photos with her letter. One is the 1923-24 class photo and the other photo is of Irene and Mildred Christoph in front of the Quarry School.] I remember the names of Pinky and Punky Beck. I had a kid whose name was Joseph Czachesz (pronounced zaz). I had a hard time remembering how to spell it, but now I still remember (Czachesz). I heard when he was older he changed the spelling. I taught at the Quarry before the Terlinden kids started school, and that’s a long time ago (75 years). The picture is all I have left to remind me of the Quarry School. I’m surprised I could even find it alter all these years. After receiving Irene’s letter, I called her to set up a time when we could meet and talk about her days as a Quarry School teacher. I agreed to visit her at her home in Clinton, Wisconsin, on January 3, 2000. She lives by herself in a pleasant mobile home. After our meeting, she fed me lunch before I left for my hour-drive home. The following is what Irene remembers. I was born in Cambellsport on a farm with my eleven brothers and sisters. Their names were John, Emma (Terlinden), Alma (Ode­kirk), Elsie (Buss), Edwin, Herbert, Leonard, William, Frieda (Halverson), Rose (Ferber), Irene (Brellenthin) and Alice (Broukhoff). 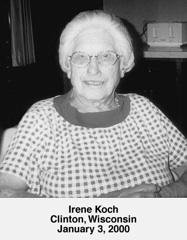 My parents were August Koch and Augusta (Kocher) Koch. I was lucky to be one of a big family. We had everything but money. Out of all my brothers and sisters, I am the only one left. I never had a fight with any of them. My sister Emma married Charles Ter­linden, and he was the Quarry school clerk [1917-34]. I lived with them when I taught at the school, and my sister Rose stayed with the Terlindens also when she was a teacher in 1918 and 1919. I graduated from high school when I was 16. I wanted to go to nursing school, but I was too young, so I went to the “normal” school for a year in Milwaukee. I taught for two years in a one-room school near Ke­waskum, and I taught at the Quarry School in Pewaukee for two years. I quit teaching to go home and take care of my sick parents. I was the only one not married at home, so I took care of my mom and dad till they passed away. There were no nursing homes back then. My mother died in 1926, and my father died in 1930. Soon after that, the farm was sold, and I went to live with my sister Elsie in Kewaskum. I liked teaching at the Quarry School. School began at 9 o’clock in the morning and went till 4 o’clock in the afternoon. I rang the school bell a lot to call the children to class. Mildred Christoph was teaching the lower grades, and I was teaching the upper grades. I didn’t keep in touch with Mildred after I left. I moved away and didn’t come back to visit. I didn’t do much socializing because I didn’t know anybody. I knew some of the parents. The Murrays lived near the Terlindens. I knew “Grandma Murray,” as we called her. I also knew Iva Graf, but that was about it. I walked to school most of the time. The Terlindens lived only about a quarter of a mile away from the school. There were some colored folks who lived in the “shacks.” What we called “shacks,” were houses built by the Quarry for its workers. They caused trouble by drinking and then one man stabbed his wife at the tavern. One time there were two boys fighting on the playground. They were the same age, but one was black and one was white. So I went out and had one in one hand and one in the other. The mother of the colored child was across the street, and I thought I would have troubles, but nothing happened. A cross was burned by the corner near the tavern, and the colored people moved on again. One of my students, Charles Davis, was causing trouble one day. I don’t know what it was, but I shook him up. I took him by the nape of the neck. He was sitting down or he would be bigger than I was. I busted all the buttons off his shirt, but I didn’t have any trouble after that. The other kids had their eyes opened. As little as I was, I wasn’t going to have them run over me. But now you can’t touch a kid anymore. We had discipline. When the kids were in school, I had discipline. One day, after we started in the morning, it got black as night. We couldn’t see across the street. The kids were so scared that I had them put their heads down on their arms, and I talked to them all the time. It didn’t last too long, but I didn’t know what it was. I never heard what caused all that blackness. The Terlindens had a “hup” mobile and I would take the car and go downtown. I had my drivers license then, and I got a new drivers license when I turned 96 years old last year.